PuzzleGirl here with you again. Whenever I sit in for Orange on late-week puzzles, I have a little panic attack about the fact that I might not be able to solve the puzzle. I mean, that's just a fact. 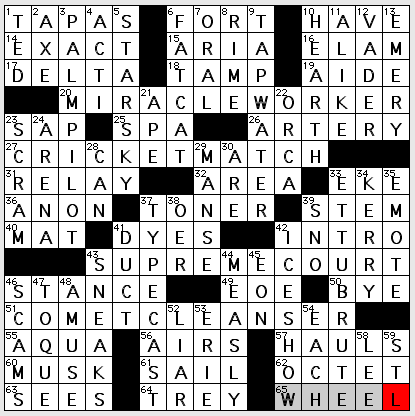 I've improved a lot over the past couple years, but it's not a given that I can finish a Friday or Saturday New York Times puzzle. And let's just say there's a really good reason that I don't volunteer for the Saturday Stumper. How did I do this week? Find out after the jump. Oh, but before we get started, I understand there was some discussion over here a while back about the various PGs in CrossWorld and how they (we) should be ranked. I believe I ended up as PG2 behind Paula Gamache. Which is fine. There's no way I'm dumb enough to think I belong in front of Paula on the list. But it occurred to me that I wouldn't even be in the second spot if you guys had remembered Peter Gordon. So. I decided that as long as I'm going to end up a ways down the list anyway, I would prefer to be PG-13. I think that should work for everybody. But enough about me. Let's see what I think about the puzzles. So, what do you think? Did I finish this one? With no mistakes? Why, yes. Yes, I did. Yay me! I struggled a bit, especially in the NW, but I stopped the clock just barely past 30 minutes, which is a few minutes faster than my average Saturday time. It's actually making me feel a little cocky about this year's Puzzle Five, but I'm sure I'll regret that. Where did I stumble? I had the SSION in place for [What a student might not go without?] and wanted the answer to be some sort of EXAM instead of PERMISSION SLIP. (Actually, my first thought was LAPTOP or IPHONE or something, but ... that's totally inappropriate.) EXAM led me to believe "Pooh-Bah" came from THE MASONS, which seems reasonable. I mean, since FLINTSTONES and HAPPY DAYS wouldn't fit. (Correct answer: THE MIKADO.) Entering TOLL BOOTH for TOLL PLAZA didn't help things down there. But it all eventually worked itself out. RIKKI TIKKI TAVI showed itself pretty early. What with all those Ks in place, it could hardly be anything else. But I could hear ANNIE LENNOX singing "Talk to me / Like lovers do ...." Turns out that's a whole different song than STEVIE NICKS's "Talk to Me." I also had ELUDE for EVADE and ALLER for AVOIR down in the SW for a while. And since [Pathology pioneer Sir James] PAGET and [18-season Mariner EDGAR Martinez] were total guesses, I'm actually kind of surprised that corner pulled itself together. There's obviously a lot more we can talk about with this puzzle, but there is a slice of pumpkin pie in the kitchen calling my name so let me get the L.A. Times puzzle out of the way and I'll see you back here tomorrow. 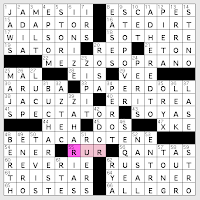 I thought we might have a theme going with the two double-Z answers: MEZZO-SOPRANO and JACUZZI (22A: Carmen, for one / 38A: Maker of many jets). But no. Then when I saw more Scrabbly letters, and thought we might have a pangram on our hands. But no again. All it needs is an effin' F. Bummer. 19A: Zen enlightenment (SATORI). Sometimes considered the first step toward Nirvana. 10D: Belgium winter hrs. (CET). Whoa, what? That would be Central European Time. 13D: Former Tennessee Titans tight end Kinney (ERRON). Insert your own err-on-the-side-of-caution joke here. 24D: Sprites of Persian mythology (PERIS). Apparently they rank between angels and evil spirits. Kinda like humans, I guess. 50D: "The Hustler" author Walter (TEVIS). I didn't know "The Hustler" was originally a novel. 62D: Knotted pile carpet (RYA). It's a traditional Scandinavian rug. If you do a Google image search, you see a wide variety of colors and designs, so I'm not sure what it is that makes these rugs their own category. Something about the wool or the knots I think. 33A: Inexpensive kids' toy (PAPER DOLL). I'm pretty sure toy makers have discovered a way to make paper dolls expensive. 47A: Classic Jag (XKE). 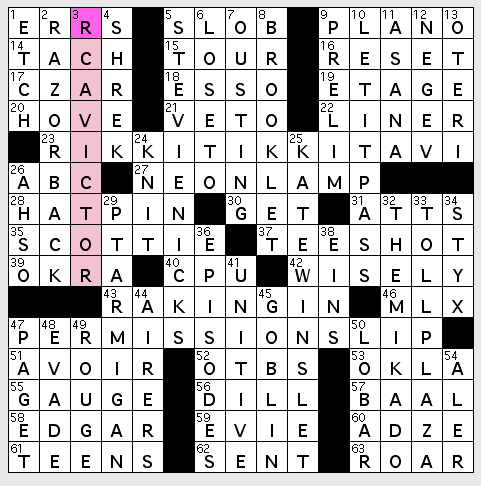 I always want there to be a J in this answer. And there never is. 4D: Derby town (EPSOM). Epsom, Essex, Sussex ... they're all the same to me unfortunately. 34D: Dallas Mavericks owner before Cuban (PEROT). Kept reading this as "Dallas Mavericks owner Cuban" and couldn't figure out why Mark wouldn't fit. 39D: Golfer Babe who was a six-time AP Female Athlete of the Year (ZAHARIAS). So, yes, I know her name was Babe, but "Golfer Babe"? That doesn't seem right somehow. • 20A. MIRACLE WORKER [Member of Smokey Robinson's group, while performing?]. Pick a tune, any tune. • 27A. CRICKET MATCH [Sports contest for a member of Buddy Holly's group?]. Oh, I loved Buddy Holly and the Crickets as a kid. Still do. Here's why. • 43A. SUPREME COURT [Legal venue for a member of Diana Ross's group?] Let's hear it for the girls! • 51A. COMET CLEANSER [Soap for a member of Bill Haley's group?]. Bill Haley and the Comets were just about the first folks to get the ball rollin'. And popular music was never quite the same. The four groups that Patrick singled out provide more than a trip down memory lane. Each one made a real difference to the genre; each is still listened to today—and not only by the boomer generation. I'm so grateful for radio shows like Felix Hernandez's "Rhythm Review" on WBGO that spin soul's and rhythm 'n' blues' best. It's worth checking out on line if you don't live in the New York area. • "ET TU, BRUTE?" [Famed Shakespearean last words]. It's the phrase in its entirety. Be still, my heart! [It takes weeks to complete] is not any particular task, but merely a MONTH. [One held for questioning] is not a person, but a TEST. we held a test last week to "question" our students on physics, i guess. [Tag line] is the AS IS that might appear on a tag at a yard sale or flea market. a few outright traps: [___ reader], four letters? nope, not UTNE this time (note the lowercase r): it's MIND reader. [Unrefined], CR___? i put in CRUDE, but it's CRASS, meaning unrefined socially rather than chemically. [Augustan-era poet] is not a poet from the augustan era of english literature like pope or swift, but VIRGIL, who wrote during the reign of augustus caesar. but i almost feel like you had to be overeducated to fall into this trap. a couple of unnecessarily stuffy clues: why [Elusive one] for DODGER? nobody uses DODGER to mean one who dodges, unless they're talking specifically about a draft dodger. 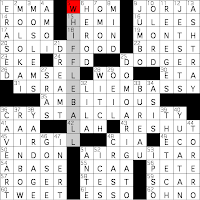 there's no real alternative for a word like RESHUT, but DODGER is perfectly cluable via the baseball team. and [High-frequency sound] for TWEET seems hopelessly out of touch, given that 99% of the time TWEET now means twitter posting. clue i still don't get: [Safe to crack] for PETE. huh? is this an adjective or a noun? a person (pete safe)? no idea.